This is an article in which we collaborated with our friends at Sanctuary Hill Retreat and Renown PR – thanks team! Holly Reid is a wonderful reporter for the New Zealand Herald, such a pleasure to host. Holly Reid leaves the rat race and finds yoga and birdsong. 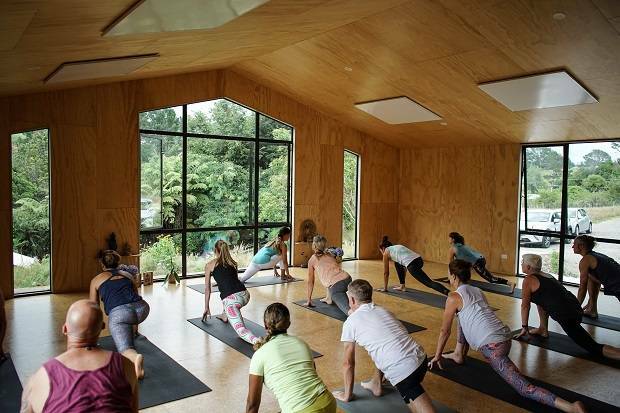 “Think about the quietest sound you can hear this morning,” says Bhavani Davies, halfway through my last yoga class on a two-day retreat at Taranaki’s Sanctuary Hill. I listen intently and, right on cue, a bird calls from distant native trees before the deep, steady breathing of a nearby classmate brings my attention back into the room.sed, surrounded by soft blankets and the warmth from a panel heater on the ceiling feels like sun on my face. Would I have noticed that bird two days ago? I doubt it. We’ve just finished an alternate nostril breathing exercise, using long exhalations and shorter inhalations. Richard Davies, co-owner of Sanctuary Hill Retreat with wife Bhavani, says this technique, practised at traditional Hatha yoga classes, activates the side of the nervous system that helps us rest, relax, and slow the blood pressure and heart rate down. But still, the bird surprises me. Richard and Bhavani, or Brenda as she’s known outside yoga circles, say they notice a definite change in visitors towards the end of retreats. “When they leave, everyone always looks bright. Their eyes have a bit of glow in them,” Richard says. The couple have dedicated the past 13 years to yoga and its benefits, by studying the well-established Sivananda philosophy stemming from ancient Indian traditions. They first met at a Canadian Ashram, when Brenda, an architect, arrived from her home country of Mexico and Richard, a Kiwi, took a break from being private chef on a multi million-dollar US yacht. Their friendship eventually brought Brenda to Taranaki where Richard, or Ram — his yoga nickname earned in the Ashram — had by then established the first Sivananda-affiliated yoga centre in the country. Now with two children, Oliver, 5, and Sophia, 3, they own an idyllic, rural haven dotted with fruit trees, have built a Scandi-style yoga studio and opened Sanctuary Hill six months ago to share with other busy people the knowledge and skills they’ve gained along the way. Their weekend retreats are designed to help the body and mind slow down, rest and rejuvenate. Brenda says many guests arrive at the peaceful setting tired and stressed out from work or personal challenges. They’ll find flowers in every guest bedroom on the ground floor of Richard and Brenda’s home and in separate wings off the nearby studio, which is nestled into a hill. There’s a cosy throw on each white bedcover, hot water bottles and soft fluffy towels. There’s also a bookcase stacked with meditation, cooking and yoga resources, and a wide range of herbal tea. “All those little details are important to us, just so people feel at home,” Brenda says. Another big drawcard is the food. A sought-after chef, Richard creates three “living” plant-based meals a day, all designed to detox and cleanse the body. They are vegetarian, dairy-, gluten- and sugar-free, including dessert — and taste unbelievably satisfying. There are also nutrient-rich, cold-pressed juices often made with veges from the garden. The diet helps create positive changes that people can take back home and a detox clears the taste buds, Brenda adds. During retreats, up to 10 guests start each day with meditation before a dynamic 90-minute Hatha yoga class. A hike in native bush or at the beach follows to reconnect with nature. It’s back to Sanctuary Hill for lunch, with various workshops through the afternoon before a restorative yoga class in the evening, with an emphasis on breathing and relaxation. “Yoga is not just about the physical stretches,” says Brenda, describing it as more of a lifestyle that can help us handle challenges. A yoga pose restricts the body — adding stress — but with practice, you can control your breathing and learn to manage the situation. “It’s the process of learning how to relax while challenging yourself and those lessons go through life with you too,” adds Richard. Is two days is enough to make those lessons last, I wonder? I catch a glimpse of my eyes in the mirror before leaving and I’m sure the whites are whiter. I’m also hearing birds outside my window. Husband and wife team Gina and Tama Blackburn have all the local secrets to help you discover something uniquely Taranaki. They run Nau Mai Tours, connecting visitors to “people with passions”. “It’s the undiscovered jewel in the country to connect with people,” Gina says. Views from this spot on rolling coastal countryside are spectacular north and south. Here, they manage to produce a pinotage from vines battling exposed conditions on the slopes below. The restaurant is welcoming with ceiling-high windows so you don’t miss the view. Chef Sohnke Danger’s German heritage influences some dishes, like the traditional Schweinshaxe (slow-cooked pork). ● 738 Surf Highway, New Plymouth. A popular central New Plymouth stop, Monica’s Eatery has plenty of enticing menu options, with some Italian influence. Named after Monica Brewster, a local well-known arts patron and women’s rights advocate, the cafe adjoins the country’s first contemporary art gallery that she helped establish. Don’t miss the adjacent Govett-Brewster Art Gallery and Len Lye Centre. Its distinctive stainless steel exterior and rippled concrete interior walls have become an attraction. A relative newcomer to craft brewing in the region, Three Sisters is the creation of husband-and-wife team Joe Emans and Sarah Markert. Over the past year, they’ve transformed their Oakura coastal garage into a boutique brewery, where they are now turning out award-winning craft beers — including a pilsner, IPA, APA and a mānuka smoked lager. Their production runs are limited, so you won’t find this beer far and wide. Another new boutique business turning heads is this impressive distillery and its topshelf label, Juno Gin. Established by engineer Dave James and his gin aficionado wife, Jo James, their gin is infused with interesting botanical flavours, sourced locally where possible, such as strawberries and chilli, or berries and thyme. It’s better to enjoy neat, or with a splash of subtle mixers, Jo says. They make 200ml bottles as well as a standard 700ml size, so people can enjoy a smaller “taste adventure” with friends. This 12km smooth walkway is a must-see, either on foot or bike. It hugs the coastline with significant artworks dotted along the way, including Len Lye’s famous Wind Wand, struck by lightning last year. ● Start at St Aubyn St, New Plymouth, and head north. Seeing the stunning beach and forest landscapes of Taranaki by horseback is something quite special. Lydia Quay offers a range of treks and fun competitive group games days. She also runs Clearwater Riding School and is a highly regarded local mentor. Yes, surfing is a year-round activity in Taranaki. Fitzroy Beach has a huge reputation and its attraction doesn’t fade in the winter. For the best breaks of the day, however, local surf guns Tama Blackburn and Eli MacDonald are your go-to guides. They run NZ Surfing Adventures and deliver surfers from around the world to secret spots, using a network of contacts and weather forecasting. flies from Auckland to New Plymouth with one-way Seat fares from $56. Prices are $585, including meals and two nights accommodation, or $185 for one day retreats, including two meals. Book a tour with Nau Mai New Plymouth tours to find the best of Taranaki.